Dylan Scholinski was born Daphne Scholinski. As a young girl growing up in the Chicago suburbs, she played first base in Little League and preferred drawing to playing with dolls. When she was 15 years old she was locked up in a mental hospital, diagnosed as "an inappropriate female", and spent the rest of her high school years undergoing extreme femininity training. At 18, her insurance ran out and she was discharged. 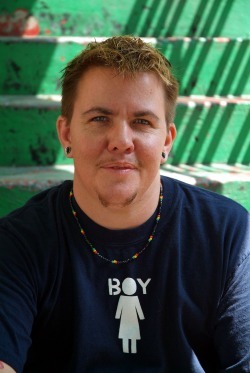 Now 46 years old, Dylan resides in DENVER CO and is a distinguished artist, author, and public speaker . Dylan has appeared on 20/20, Dateline and Today to discuss his experiences and has been featured in a variety of newspapers and magazines. Recently his award winning book (The Last Time I Wore a Dress: A Memoir - Penguin/Putnam) was listed in the Top 10 Must Reads in Out Magazines first transgender issue. His work not only portrays the anguish of his hospital years but also his ultimate triumph. Dylan is the founder/witness for the Sent(a)Mental Project : A Memorial to Suicide. He spends much of his time working in his studio, public speaking, creating zines - such as Freedom of Depression, Please Forgive Me For Judging You, Sent(a)Mental - and frequently opens his studio to a variety of Denver metro youth, to provide safe space to explore and discover ways of expressing and empowering themselves without bringing harm to themselves or others. I paint for my survival and myself. Time and again, I have realized that without my art, I would likely be dead. At the age of 15, primarily because I lacked signs of being a 'heterosexual female,' I was labeled 'mentally ill' and confined to a psychiatric ward. I lost over three years of my youth. I consider all of my art to be autobiographical. I tell stories about my life: what I am thinking, feeling, experiencing; creating a sort of map of living and breathing emotions. I rarely hold my breath in a painting. Unlike in real life, where the simple process of breath, the literal proof of my own existence, poses a daily challenge. The content of my paintings deals with the experiences I had leading up to and during my years in the hospital and continues on to reflect the struggles I face being transgender, gay, human, as well as an ex-mental patient. My purpose in my work is to encourage the sympathetic indulgence of emotions, which most are ashamed to give way to in their own lives; to try to get people to feel things and to help to reacquaint them with themselves. As much as it is personal, my art is also a social commentary: as a society, we view the emotional world as an oversimplified dichotomy, seeing emotions as either "good" or "bad." We all spend outrageous amounts of time and energy trying to rid ourselves of the "bad," and I believe that in doing this we can never truly experience the "good" and that it is only once we learn to embrace the full spectrum of emotions that we will fully experience our lives, ourselves, and each other. We often find it hard to tolerate those with full emotion because it reminds us of all we don’t feel ourselves. It holds up a mirror that we see as ugly, self-indulgent, and pitiful. What we rarely admit is that it is ourselves that we see, a side that many of us have fought very hard to leave behind. In my work I am attempting to be this mirror by showing myself. It is my hope that once you get in touch with these emotions in yourself that then you may identify them in others and as a result we will have better understanding, compassion, and tolerance of each other and all of our differences. I don't think in terms of gay/straight, male/female; who is more over this way or that way. I believe that if we just came to terms that we are all both, it wouldn't matter, and we would begin to see ourselves in everyone. I have painted most of my life, but it is only in the last 10 years that I have realized my place as an artist. I have been to school, read books, looked at art; and just like when I was 13 looking for myself in magazines, I have found it hard to see myself here. Where is the individual's passion, life, and emotion? Where is the truth in painting today? If it is true that art saves lives, as it has mine, then the truth must be shown; and my individual goal is to be as honest as I can be. Born Daphne, Scholinski grew up near Chicago. A tomboyish young girl, she suffered intense bullying for not being girly enough. She became a troubled teen whose behavioral problems doctors attributed to a diagnosed "gender identity disorder." At age 15, she was committed to a psychiatric hospital, where she stayed for three years. Her treatment was designed to make her identify as a "sexual female." It included make-up lessons, mandatory dress requirements and coaching in the art of flirtation. A 1997 book recounting the experience, "The Last Time I Wore a Dress: A Memoir" (Penguin/Putnam), received national attention. Unsurprisingly, the artist's confinement - and the questionable and spectacularly unsuccessful course of treatment - forms the organizing theme of Dylan's work. Each painting is like a personal journal entry commenting on a facet of the artist's tortured childhood and subsequent steps at resolving the identity issues that had caused so much pain. What is surprising about these raw, edgy works is their wit and elegance. Humor has been the artist's path from darkness. It forms a path for us, as well, providing a safe route for us to enter into a world that we would otherwise find too disquieting. The artist's wit assures us that these are not the rantings of a mental patient. They are lucid, self-aware statements of an artist who sees his history with a surprising level of clarity, acceptance and forgiveness. Painted in the grays, blacks and foggy colors of a nightmare, the paintings are nonetheless aesthetically pleasing. They are technically strong and exquisitely balanced. Each work commands attention, compelling us to focus closely - to dig through layers of history and subtle (sometimes not so subtle) allusions so that we might reach an understanding of the artist's past and his triumphant arrival at the present. They invite us to feel our own emotions and to connect with the artist's. They seek unity through empathy. Dylan explains, "I paint for my survival and myself … without my art, I would likely be dead. My purpose is to encourage the sympathetic indulgence of emotions. If you can reach these emotions in yourself, you may identify them in others, and we will all have better understanding, compassion, and tolerance of each other." Now 41, Dylan Scholinski, resides in Denver, CO and is a distinguished artist, author, and public speaker. Dylan has appeared on 20/20, Dateline and Today to discuss his art and experiences and has been featured in a variety of newspapers and magazines. His work not only portrays the anguish of his hospital years but also his ultimate triumph.